Which is best for managing multiple international websites? Deciding between the various approaches to managing multiple international websites is a critical step in the localisation process and one that is likely to significantly affect the future performance of a website. One of the most common challenges faced by marketing, ecommerce and I.T professionals when expanding internationally is deciding on how to organise their infrastructure to best manage the translation process. There are no hard and fast rules and the decision depends on a huge range of factors. Below are the three main options available to businesses looking to expand their operations into new territories including the pros and cons of each method and best practice advice for different markets around the globe. The simplest solution is to have a standalone website on a different domain or subdomain with content presented to users in their native language. A standalone site allows businesses to develop a unique offering for a specific market which include a completely different design, layout, information architecture and contain unique, localised content. A standalone website can then be hosted in the target territory, using a local ccTLD (country code top level domain) such as .cn for China or .ru for Russia. These domains typically rank better for some local search engines – notably Baidu and Yandex. Local users also tend to place more trust in them. For instance, it’s widely recognised that French users place more trust in .fr domains than generic domains such as .com. A standalone site also benefits from the SEO advantages of geo-targeting and domain-level trust factors. For instance, it’s almost impossible to rank on Baidu in China without a .cn domain hosted on a local server. So a separate domain and host makes sense for businesses entering the Chinese market. Users accessing the website will experience faster page loads since the site is hosted relatively close to users – boosting SEO, user engagement and conversion rates. Businesses separating their sites out in this way don’t have to concern themselves with data localisation laws currently being passed in places like Russia and Brazil whereby data collected in the region cannot be transmitted externally. So, in all, standalone sites allow businesses to develop truly unique experiences for users in different territories without affecting sites in other territories – allowing for true site localisation to be implemented. However, having a standalone website can place a burden on resources as bug fixes, software functionality improvements, security patches and other design or technical changes will have to be completed on each site separately. Businesses also need to register different domains and pay for hosting in the target regions – although these costs tend to be relatively low. Organisations that decide on the standalone website approach should ensure that they register their trademark-related domain names. Cybersquatting, the process of registering domains names with bad intent in order to profit from another organisation’s trademark, is rife in many emerging markets. Proxy-based solutions allow for the retrieval of content from a client server by a separate server (the proxy), which is then translated and delivered through the proxy to the end client. Translation proxies have become popular in recent years due to their relative speed and ease of implementation. 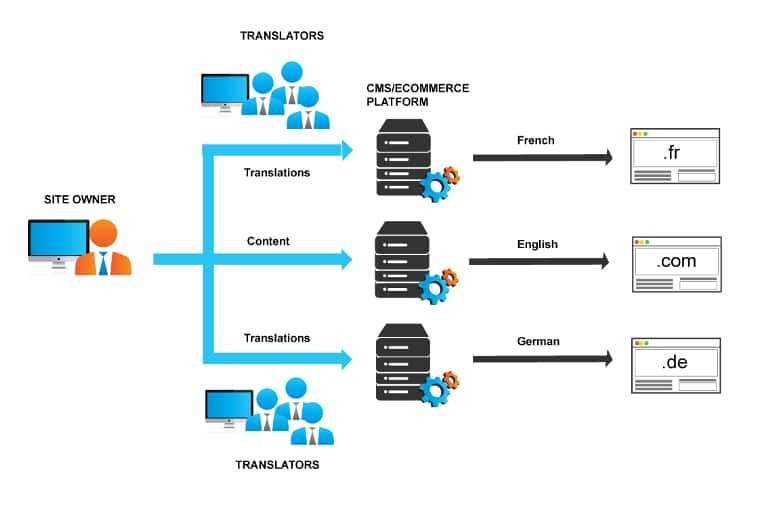 Most of the time, the translation proxy sits on a server in the cloud between the organisation’s source website and applies the translated content so that it is visible to users. When new content is loaded onto the source website or if existing content is modified, the proxy automatically detects it – creating a new job for the translator within the translation system’s workflow. Often, rules are put in place to ensure the right type of translation is performed. Translations can be completed without additional staging or QA and are often deployed more quickly and affordably than on a standalone website or a content management system (CMS) or ecommerce integrated solution. Proxy solutions offer a good alternative to web CMS integration solutions for largely static websites that require few, if any, regular changes to the functionality or design of pages. However, sites that use a lot of dynamic content, personalisation, product recommendations, or ones that employ conversion rate optimisation techniques such as split A/B and multi-variate testing are not suited to proxies. This is because the proxy solutions use screen-scraping or imports of static content from the source database/CMS so the sites derived from this data are essentially static. Furthermore, the incremental costs of proxies can also become prohibitive when dealing with more than a few languages and locations. For businesses that operate in regions with a shared language and culture but require slightly different content – an additional proxy is required which further increases costs. Businesses should also be aware that if they opt for a proxy-based solution, they are relinquishing control of their site and technology to a third party. If the proxy solution provider provides a poor service, or the site suffers from downtime or performance issues, it’s very difficult to switch provider. Website, search and advertising technology evolves very quickly. If an organisation wants to remain at the forefront, offering the latest technologies to users, then a proxy solution isn’t suitable. Essentially, they lock you into the past. For these reasons, proxies are sometimes recommended as a quick and dirty solution for testing new markets. Startups often favour proxies for this reason – allowing for market testing of their minimum viable product approaches to product development. However, many of these businesses fail to consider that an incomplete solution is not likely to resonate with their target audience. These businesses could be undermining their localisation experiments by not proving all the enhanced functionality of their English-language sites to users in these test markets – significantly decreasing the chance of success. So, for larger, more established organisations with a long-term expansion plan – proxies tend to become a burden, reducing flexibility dramatically and increasing the inability to properly localise their offering for local markets. Organisations that decide to go down the proxy route should obtain guarantees that the vendor will provide them with all the content and translation memories in their preferred format in the event that they decide to increase their prices substantially, if the quality of work or service is poor or, worse still, if they go out of business. An increasingly popular method of managing the translation process is by implementing a CMS or eCommerce Integrated Solution. When the source content is ready for translation, it is transferred to the provider’s server using FTP or via an API using a data exchange language such as JSON or XML. Once it’s complete, the provider usually returns the translated content to the client using the preferred method (FTP/XML/REST etc.) from which the client can import the content back into their CMS. Similar to the proxy solution, the client can specify the type of translation required for a specific audience or market, but the CMS integrated method allows for much greater flexibility when it comes to deciding not only the type of translation but style, tone-of-voice and specific glossaries to be used when performing the translation. Unlike with the proxy solution described above, the client then has the control to edit the text on their own system before and after publication. For global retailers or brands that are running highly- personalised, targeted, localised campaigns, an integrated solution provides better support for multiple teams in different locations to collaborate. With dynamic costing of translation jobs, better management reporting of translation and integration with an organisation’s CRM or analytics package, it’s easy to see why large organisations are increasingly looking to develop integrated solutions. Even if businesses are operating in regions where a separate domain and host are required – a CMS solution is still the best method of managing the translation process. This is because once the solution has been developed and assuming that the same CMS is being used to power all of an organisation’s websites – then the timescales and costs of additional integrations can be kept to a minimum as most of the work has already been completed. A CMS integrated solution also allows brands and retailers to keep their websites up to date with the latest technology to support new mobile devices, file and video formats, interactive functionality, mobile or desktop apps and bricks and mortar store inventory integration to deliver a true omni-channel experience to the end user. It should be noted that the CMS/ecommerce integrated method does have significant overheads when compared with a simple proxy-based solution. This is because resources are required to design, configure and manage the import/export process. However, once implemented, an integrated solution will soon begin to deliver ROI – offering full control over a site’s design, content, SEO, style and tone-of-voice – allowing retailers and brands to be deliver rich, personalised content to specific target audiences globally.